Well, Speaker requested that I type up a short guide on playing Annie, so here it is. I've seen a lot of up-and-coming players trying to learn how to play Annie, and with good reason. She's an inexpensive character to purchase using Influence Points (IP) in the League of Legends store, and she's one of those champions that's easy to learn, difficult to master. I don't pretend to be the greatest Annie player in the world, but I can give some general guidelines. This is updated now for Season Two. Annie is a mage champion. She is squishy and easily killed, and she relies on her abilities to do damage. In order to increase her damage, you will want items that add to ability power (AP) rather than items that increase your attack damage (AD). When playing Annie, your role in the team is to stay behind the beefy tanks/melee damage per second champions, and only engage when you are sufficiently protected. It's important that you never forget how easy it is for the other team to kill Annie; an Annie player who finds herself caught out of position and killed can swing team fights very easily. Your goal is to drop a big fat area of effect stun (see below) right into the middle of the enemy team in every big encounter. Played successfully, this is a devastating move and will win entire games. Fire off your spells, break off engagement while they are on cooldown, and only then return to the fight. Remember that Annie has extremely limited escapability, and if you get caught out of position, you are probably going to die. Annie excels as a farmer, and this is a good reason why she makes for a strong selection when learning how to play the game. You should never have trouble getting minion kills with Annie; if you are struggling with this, try running some practice games with AI bots when you won't have to worry about harassment. Annie is strongest in the midgame, from about levels 6-13, where her area of effect stuns and strong damage from abilities can wreck havoc. Annie tapers off quite a bit in the lategame, where her main task is stunning enemy champions so that the ranged carries can score tons of easy damage. Overall, Annie is a somewhat underpowered mage champions in League of Legends, but highly recommended as a starting champion to learn. The one downside to Annie's passive is that you will often find yourself waiting with your stun ready to go, and then not being able to use your abilities out of fear of cycling through your stun. This is unfortunate, and unavoidable when playing Annie. Better safe than sorry - do you really need those two or three extra minion kills? My preferred way to play Annie is to wait with her stun on spellcast #4, because this does not display the swirling white circle to the enemy team. (When enemy players can see that Annie has her stun ready, they usually play more cautiously.) The idea is to sit at spellcast #4, and then cast Annie's "E" skill (Molten Shield) immediately followed by her ultimate, which will then stun the target thanks to cycling through one additional spell. This allows Annie to go into battle with the extra Armor and Magic Resist of Molten Shield, and can often catch the enemy champion(s) off guard, especially if you use summoner Flash as part of the combo. Molten Shield -> Flash -> Tibbers stun -> Disintegrate -> Incinerate -> Ignite is an almost guaranteed kill if executed properly. Disintegrate (Q): Annie shoots off a fireball at the intended target. Disintegrate deals medium damage and has medium range; the spell is also on a relatively short cooldown. Disintegrate's key feature is that it refunds the mana cost of the spell if it kills the target. This makes Disintegrate the key farming ability for Annie - you should ideally be killing a minion every 5 seconds or so as it comes off of cooldown. Disintegrate is also useful for harassing enemy champions, however be aware that this will not refund the mana cost, and you can run yourself out of mana relatively quickly if you are too aggressive in using the skill. The correct time to harass enemy champions is when your stun is ready via Pyromania: stun the enemy champion with Disintegrate, then walk up and hit them with Incinerate plus one or two auto-attacks. This won't kill the enemy champion (unless they are very stupid indeed!) but it will allow you to whittle down their health a little and set them up for a kill at level 6, when Annie gets her ultimate. In terms of skilling, I suggest maxing Disintegrate first, taking points here at levels 1, 3, 5, 7, and 9. Incinerate doesn't have enough range, and Molten Shield is, well, a shield! Incinerate (W): Annie shoots out a narrow cone of fire, damaging enemies in a short triangular-shaped region in front of her. Incinerate does the most damage out of Annie's non-ultimate skills and it can hit multiple targets at once, however it has extremely short range. You need to be right next to the target in order to hit it with Incinerate, which is generally a bad place for a little girl and her bear to be! One of the mistakes that new Annie players tend to make is over-using Incinerate. You should not be using this skill very much while laning, because of its mana cost (no refund like Disintegrate) and short range. Only fire off this skill when harassing enemy champs or if you'll lose out on a minion kill otherwise. Annie generally has to hit on a stun first with Disintegrate or Tibbers in order to get close enough to use Incinerate. Under other circumstances, it's simply too risky to run forward and likely get killed by the enemy. Incinerate should have second skilling priority after Disintegrate (and Tibbers); I generally takes points at levels 2, 8, 10, 12, and 13. However, if you are anticipating an extremely early teamfight (prior to minions spawning), Annie can begin with Incinerate and charge up a stun at the fountain, which can be the difference in winning a level 1 teamfight. This is pretty rare, but in those cases you'd want to start with Incinerate instead of Disintegrate. More advanced Annie players can max Incinerate first, leaving a single point in Disintegrate. This makes it significantly harder to last hit, but adds more damage to your burst combo. In this scenario, place points into your W skill at levels 2, 3, 5, 7, and 9. Your Q gets the other skill points at 1, 8, 10, 12, and 13. Molten Shield (E): Annie creates a shield around herself, which increases Armor and Magic Resistance until it wears off. Think of this as a very weak version of the Rammus Defensive Ball Curl, since it operates on the same principle. The defensive gain is rather significant, with Annie gaining 50 Armor and Magic Resist at the top rank in this skill. Nevertheless, Annie is about as far from a tank as possible in this game, and even with Molten Shield active she will die very easily when focused by the enemy team. Molten Shield generally is not very useful in the laning phase, although the cooldown is now much shorter than in earlier patch versions. It becomes more useful when teamfighting, and Annie players should try to make sure they never enter combat without this active. I have found Molten Shield to be very useful in cycling ahead to Annie's stun (as detailed above); if you are running from one lane to another, or walking back from the fountain, feel free to pop off her shield to get one spellcast closer to Annie's stun. It's also useful in situations when you know you're about to take damage: if you see that incoming Karthus ultimate, or any undodgeable ranged projectile travelling towards you, pop on Annie's shield to minimize the damage taken. You definitely want one skill in this point early, and then max it out last: I skill Molten Shield at levels 4, 14, 15, 17, and 18. Essentially, take one point at level 4 and then always choose anything else if it's an option. Summon Tibbers (R): Annie's ultimate summons a gigantic bear named Tibbers, which deals magic damage in a small circle on casting and then can be controlled as a minion afterwards. The main damage from this spell occurs when it is cast, and dropping Tibbers into a tightly-packed formation of enemy champions, stunning them all at one go, is devastatingly effective. This skill can win entire games when leveraged properly. After Tibbers has appeared on the map, you can control him by using the Alt key, which is awkwardly placed and unfortunately can't be rebinded to anything else. This will take some practice to get used to controlling. Tibbers deals a small amount of magic damage to all enemy targets around him each second (think of Tibbers as wearing a Sunfire Cape) and has a fairly strong melee attack. Make sure to Alt-click on the enemy champion you want to attack so that Tibbers will get in a few swipes when he/she is stunned. Tibbers will last for quite a while after summoning if the enemy team doesn't kill him, something close to 30 seconds, and you can use him for all sorts of good stuff: farming minion waves, tanking enemy towers, checking brush, and so on. Summon Tibbers is on a relatively short cooldown as ultimates go, and you should feel free to use this skill pretty frequently because it will usually be up in time for the next teamfight. Obviously you should skill Tibbers whenever it is available, at levels 6, 11, and 16. Unlike some other champions, there aren't very many ways to build Annie. She's a mage, pure and simple, and anything other than an ability power build is a waste of time. The key targets for Annie are ability power (AP), magic penetration, and then some measure of survivability. Annie doesn't need very much mana to be effective, thanks to her Q, which is one thing that differentiates her from a lot of the other mage champions. Smart usage of Annie's Disintegrate should prevent you from needing summoner Clarity or a Chalice of Harmony or anything like that. You should still be taking the Golem (Blue) buff whenever possible, to avoid the need to build cooldown reduction and help dominate your laning matchup. For runes, Annie players should always take Magic Penetration marks (reds). These are "best in slot" and add considerably to your total damage. Seals (yellows) have the most flexibility. I use mana regen/level, but you can potentially take a number of different things here, such as flat mana regen, armor, heal/level, or even more AP, although the numbers for AP on seals are quite weak. Glyphs (blues) demand one of two choices: either AP/level as I have set up here, or magic resistance for extra survivability. Since Annie is a burst caster and has the goal of killing your opponent in lane, I take the ability power glyphs. On the quintessences, flat AP works better than most anything else. Movement speed isn't too useful on Annie, and I can't think of many other appealing options there. Take what will blow up the other guy fastest. 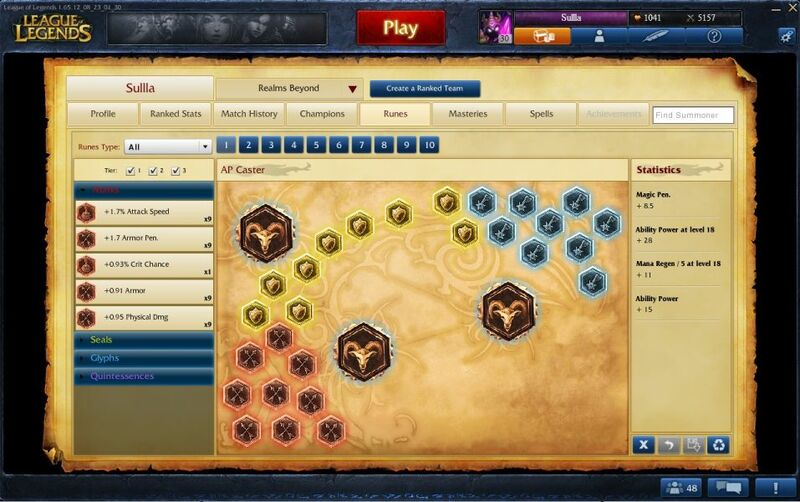 This is a simple AP page which will work well on most casters. Annie's masteries are even more straightforward, and a straight caster 21/0/9 build will likely come out ahead over pretty much anything else. Take improved Ignite, decide whether you want extra points in flat AD or minion damage, then everything else in the Offensive and Utility trees should look like it does here. For Summoner skills, Annie wants Flash + Ignite. Always. It creates the greatest chance for Annie to get a kill upon reaching level 6. Flash next to the enemy champion, unload Tibbers + Disintegrate + Incinerate + Ignite + auto attacks, and together that combination should do about 700-800 damage. Extremely powerful if executed correctly, and a kill for sure if you can combine with a jungler. Teleport can sometimes be viable, although it is a weaker option; most useful if the enemy team doesn't have a jungler and you are playing 2 vs 1 in a lane. Annie is all about burst damage, and therefore Exhaust is strictly weaker than Ignite on her. In case it isn't already clear, Annie is a terrible jungler and should never be taking something like Smite. Start with boots + 3 health potions. This is the standard start for virtually every lane. Riot attempted to create more diversity in starting items, and screwed up so badly that every solo lane now starts boots and potions. You need boots to match your opponent's movement speed, and the potions give you sustain in lane. You want to force your opponent to back first, not have to go running back to base for healing. Rod of Ages (3035 gold) or 2-3 Doran's Rings (475 gold each): I usually will build a Rod of Ages first with casting champions, and for good reason. When playing in a solo lane, you should be able to complete the Rod of Ages around the 20 minute mark, which means it should provide the full bonus by the end of the game. The Rod of Ages provides 450 health, 525 mana, and 60 AP immediately upon purchase, and then adds a further 180 health, 200 mana, and 20 AP over the next 10 minutes of game time. For an investment of 3000 gold, that will provide Annie with 630 health, 725 mana, and 80 AP, which is a tremendous deal all around. An ideal first back to base is when you have 1325 gold for the Catalyst, which provides survivability and sustain on level ups. Alternately, you can build 2-3 Doran's Rings for health and mana regen, although the Doran's Rings have been nerfed so many times that they are not very useful to stack anymore. The Dorans will let you get to your Deathcap faster than the Rod, for the tradeoff of being much weaker later on. Sorcerer's Shoes (1100 gold): Make sure to build boots alongside Rod of Ages, as it will take some time to get all of the component pieces together for the big rod. As a burst caster, there's really only one choice for upgraded boots. Sorcerer's Shoes will provide a very noticeable extra 20 magic penetration, increasing damage significantly in the early game. The longer the game goes, the less valuable Sorcerer's Shoes will tend to be (as other champs stack magic resistance), however if you get them early on, Annie can be dealing true damage with her spells and be extremely powerful. Mercury Treads and Lucidity (cooldown) Boots are simply not as useful as that extra spell penetration. Rabadon's Deathcap (3600 gold): I recommend going straight for Deathcap as Annie's next item. Deathcap provides the most ability power possible, and when playing as Annie, your role is to stun and kill people on the other team. If you aren't doing enough damage, you are almost useless to your team, as Annie doesn't possess very much utility outside of her stun. Rod of Ages, Deathcap, and boots of some kind gives you 300 AP and decent survivability. 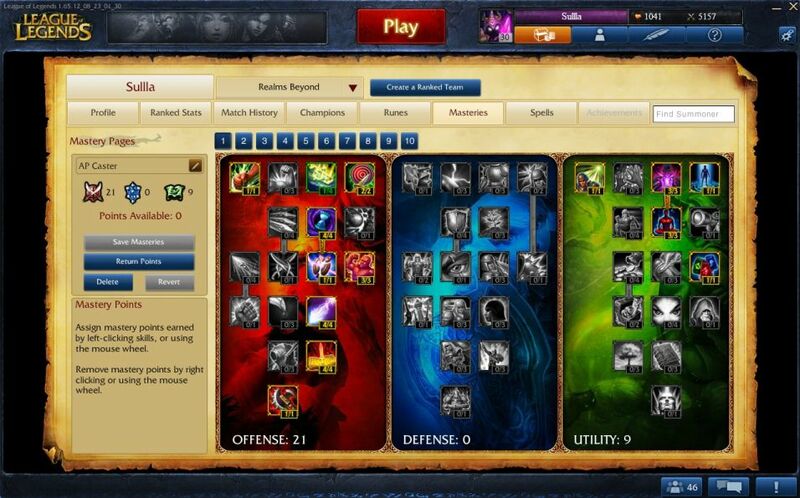 This is the core build I have generally used for Annie. Void Staff is your next key item in the overwhelming majority of circumstances. It gives you more magic penetration to further increase your damage, and Annie players will want to grab this as enemy champs begin to stack magic resistance. This is generally the last major item in an Annie build, Rod -> Deathcap -> Void Staff. From here, it starts to get situational. Although I haven't used it too much myself, Rylai's Crystal Scepter (3105 gold) is actually a strong item choice for Annie. It adds 80 extra AP, 500 health to increase her survivability, and the slowing effect from ability use is always welcome. One thing that was pointed out to me is the fact that Rylai's slowing effect will stack with the magic damage aura from Tibbers, so any enemy champions near Tibbers will automatically be slowed by 15% or 35%, since the Tibbers magic damage will keep going off every second and resetting the slow timer. Nice! I need to experiment more with this myself to see how it plays out, but it seems like a strong option. Other options include Abyssal Scepter if you want more AP and the enemy team has lots of magic damage in their composition. Deathfire Grasp is generally not great on Annie, but it can work if the enemy team has a tank stacking tons of health. (You can cut off 30-40% of their health if you hit them right at the start of an engagement with Deathfire Grasp.) None of these are core build items, but they have their place in some games. I no longer recommend Glacial Shroud of Frozen Heart for Annie. There are better options out there for cooldown reduction (Boots of Lucidity, Evil Tome) and Annie has little need for extra mana or armor. If you need protection from physical damage dealers, take Zhonya's Hourglass. Tear of the Goddess/Archangel's Staff: These items are all about stacking as much mana as possible, and Annie simply doesn't need that much mana thanks to her usage of Disintegrate. Furthermore, Annie doesn't spam her spells the way that a champion like Karthus does, and it will take quite some time to fill up the passive effect from these two. It's not that these items are a complete waste, it's just that other items would be much more useful on Annie. Chalice of Harmony: This item will let you spam spells without ever worrying about running out of mana. Again, however, that's generally not an issue, and even with its cheap cost a Chalice will delay Annie from building towards other, more useful items. If you're that worried about magic damage, go for Mercury Treads early for the extra resistance, or take magic resist glyphs. Hextech Revolver/Gunblabe: These items are a waste on Annie, since they are quite expensive and add useless attack damage and lifesteal. The spell vamp is not enough to make a difference. Just purchase Deathcap or Rylai's instead. Lich Blade: Not a terrible item choice on Annie, and I could see it working in some situations. However, Annie generally bursts down the enemy, hitting them with her stun and then following that up very quickly with her Disintegrate/Incinerate combination. Lich Bane is awfully expensive just to get in one or two auto-attacks that will do extra damage. I could see this working as one of Annie's final two items, but I think that on the whole there are stronger alternate options out there. Lich Bane seems to work better on more hybird style champions than pure ability power ones like Annie. Mejai's Soulstealer: This is a great item - if you can get stacks for it. Do you like to gamble? Mejai's will help you curb-stomp a team that you're already beating that much harder. It will also do absolutely nothing to turn around a game that your team is losing. Entirely up to each individual whether to take the stacking items, there's no right or wrong answer. I avoid them myself. Annie's biggest strengths lie in her easy farming, strong midgame, and ability to stun the enemy team. 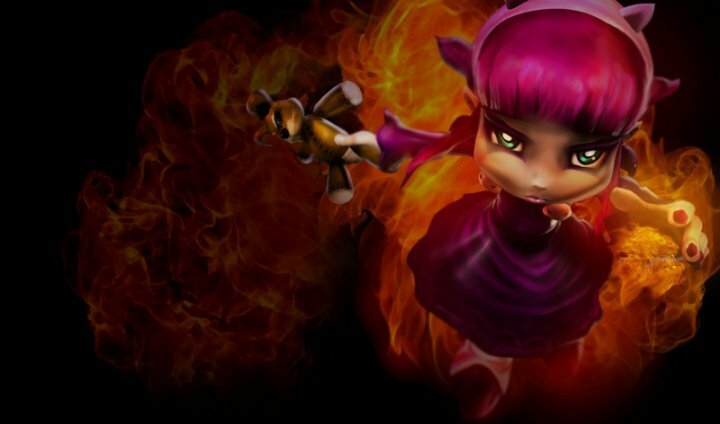 Annie is best played in a solo lane, where she can gain a level advantage and then cause all sorts of chaos by moving into other lanes and dominating lower level opponents. That said, Annie can also be effective in a dual lane, especially if paired with another champion that can stun the enemy. (OK, not really, but it could theoretically be useful in some situation.) Double stuns against a single opponent will almost certainly result in a kill. Coordinate with the rest of the team, look to initiate with Tibbers stun if the enemy team winds up out of position, and you should have a more than fair chance of winning. Annie also has plenty of weaknesses. She is very easily killed, and has no escapability aside from her stun. Annie is terrible at pushing towers, and she pushes lanes rather weakly compared to other spellcasters like Anivia and Kennen. When playing against Annie, try to take advantage of her stun, only in the opposite direction! Right after Annie uses her stun is when she's weakest: try to get up in her face and either harass her or zone her backwards to deny gold and experience. During levels 1-5, Annie is extremely weak right after she's fired off her Disintegrate stun. Her Disintegrate skill will be on cooldown for about 4 seconds, and her only other ability will be a very low damage Incinerate. Harass Annie and abuse her until her skills come back off cooldown! Annie is particularly vulnerable against melee DPS champs who can close distance quickly; laning against Xin Zhao can be a true nightmare if the opponent knows how to maintain distance correctly. Good luck, and make sure to introduce everyone to your bear Tibbers!